If that photo isn’t making you drool, then sumthin’ is wrong with you…seriously…check your pulse. This meal was FANTASTIC. But I have a confession to make. It’s a bad one. I have never done this before, but it was just so hard to resist. This recipe….ready for this one…..??? Came from a product add. Hold your gasping and assumptions. If you read cooking magazines, then you should recognize this recipe. It is like THE add this month in (I’m pretty sure) every major cooking mag. It’s from McCormick’s. 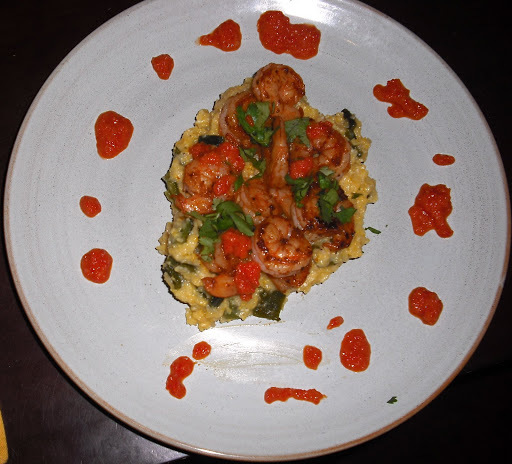 They call the recipe Smoked Paprika Shrimp with Poblano Polenta and Red Pepper Agave Sauce. I have adapted it to make it a bit easier and of course, used my own paprika and seasonings. As for the music, Matisyahu (pronounced just like it looks, Ma-tis-ya-hu) hit the music scene running a few years back. I never really jumped on the band wagon then, but his Live at Stubb’s CD has been in my iTunes library for a while and recently have been playing it quite a bit. It’s the perfect for a late sunny Sunday afternoon. His reggae beats and killer songwriting are relaxing, but still make ya wanna swing your hips and sing along. Cut tops and bottoms off peppers (red bell and poblanos). Remove seeds and white pith. On a cookie sheet wrapped in foil, place large pieces of pepper and press down to flatten pepper pieces. Place tops and bottoms and lightly drizzle with EVOO. Place under broiler and cook for at least 3 mintues or until skin is black and blistering. If you don’t cook peppers enough, they will be a pain to peel, so cook until the skin is blistering and black in large spots. Place peppers in a ziploc bag and set aside for 10 – 15 minutes. Remove and peel. Chop poblano peppers and set aside. In a small saucepan, heat EVOO over medium heat. Add onion, saute for 2 – 3 minutes. Add garlic and saute for 30 seconds – 1 minute. Add agave nectar and stir until nectar becomes watery and onions and garlic are incorporated. Turn off heat and set aside. In a food processor, combine the agave nectar mixture, roasted red pepper, 1/2 cup chicken stock, tomato paste, and cayenne. Puree until smooth or to your desired consistency. Season w/ S &P to taste. Place roasted red pepper sauce back into the same saucepan used to cook onion/nectar mixture. Place on law heat and simmer for about 10 minutes, until sauce thickens, stirring occasionally (I cooked this down until the rest of dinner was finished). In a medium stockpot, heat 2 cups of chicken stock and 2 cups of milk until lightly boiling. Whisk polenta into liquid and gently simmer for 15 – 25 minutes. Add chopped poblanos, season with S & P. Keep warm. While polenta cooks, season shrimp with paprika, garlic powder, cumin, and S & P. Mix to make sure each shrimp is coated. Heat 1 TB of EVOO in a large skillet over moderately high heat. Add shrimp and saute for 3 – 4 minutes or until shrimp a turn pick and are firm when you poke them. 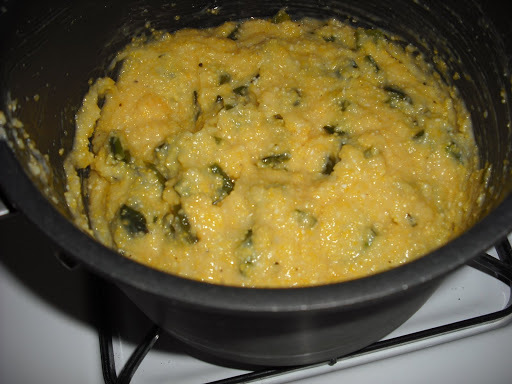 To serve, spoon a heap of polenta in the center of the plate. 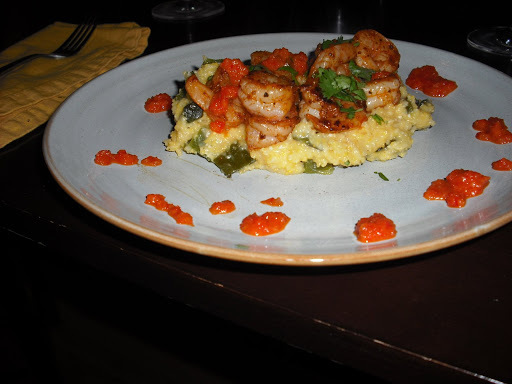 Top with a serving of shrimp and drizzle plate and shrimp with roasted red pepper sauce. Top with cilantro.